In freezing mornings my blankets tempt me to stay in them for warmth. The Battle of the Blankets began on Wednesday morning. This battle was hard but I didn’t give up. Shoving my sheets and blankets to one side, a cold air hit me like a bullet. I got up, put on my uniform. My jumper was missing, I didn’t know what to do. I stood in my hallway freezing cold. But I knew I had won The Battle of the Blankets. 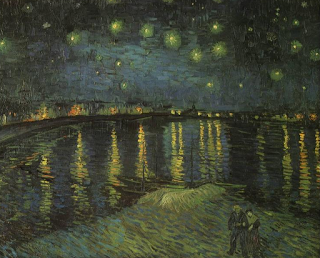 Starry Starry Night was created by Vincent Van Gogh in the year 1889. This oil painting is 73x92. This painting has a wavy cypress tree in the foreground, it almost looks like flames burning in the night sky. The peaceful yet gloomy village, has lights shining through the tiny windows. Beyond the horizon is the bright starry night. Blue is the main colour used in this painting. Both the sky and the village have this colour in it, but the village is darker. Looking at this painting, I notice one pattern. That pattern is a swirl, which is in between the golden glistening stars. Although this painting’s features are exaggerated, it’s quite beautiful. 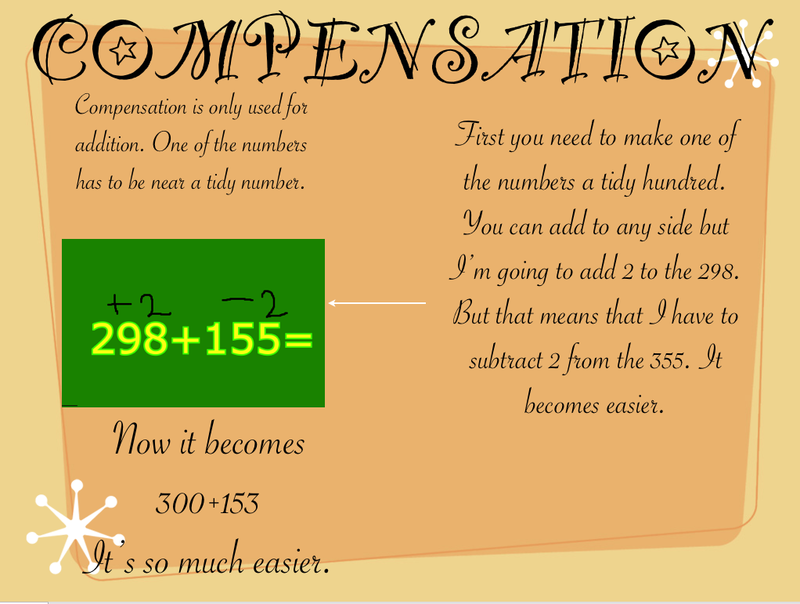 Here's a poster I made to describe and show what compensation is. Hope it helps you. Going to Skycity on a Friday night is great especially when you're having dinner at one of their most amazing restaurants Fortuna. Skycity was an amazing place to go with our family friend from Austria Ferdinand (Neni for short). When we got to Skycity we went up 3 escalators then we found the restaurant we were expecting to eat in, we made reservations for eight fifteen. It was about seven forty five at that time. So my mum, Neni and I waited on some comfortable coaches till our table was ready. Waiting for thirty minutes, we checked the clock and it was already 8.16. Back to Fortuna we went, when we reached our destination, we quickly told the receptionist that we had reservations for eight fifteen. She gave us our bill with our table number on it. A kind man led us to our table. Finally we were able to eat. Grabbing a plate we got our food, the food I ate was Lamb Shank, Garlic Bread, Stir fried rice and some pork. This meal was divine. I had seconds which was nicer than the first. With this meal I had a L&P drink. Munching on some Lamb Shank, I stuffed some Garlic Bread into my mouth. "MMM" I said to myself with my mouth full with food. As I finished my dinner, I saw some people get what looked like tea or coffee. Wondering what drinks were available, I stood up to go and check it out. As soon as I got to the hot drinks machine, I looked at the options and then spotted hot chocolate. Curiously pressing the button, steam came out of the small tubes (there were 3 tubes, the milk came out of the 2 outside tubes and the hot chocolate came out of the middle tube). Walking back to my table, I had a nice hot chocolate. Neni had a cappuccino and my mum had the same as me. Sipping my hot chocolate, it burnt my tongue but it was tasty. Soon our drinks were finished and we had no choice to leave. We left our plates and cups on our table. Fortuna is a great restaurant to go. It was more costly than McDonalds but we all enjoyed our relaxing dinner! Rm 17 have been going to the Glen Innes Aquatic Centre to have swimming lessons with professional swimming instructors. This lasted for 2 weeks. Walking to the pools, our rustling plastic bags made a lot of noise. But not as much as the chatter of the children. Filled with nervous excitement, I ran to catch up with the rest of the class. We changed into our togs when we got to the pools. Getting in the pool, the water was freezing, it made a shiver run down my spine. Our instructor explained the instructions for our activity. In this activity we had to swim 10 laps without stopping. Lying on my back, I pushed off from the wall and glided away. Kicking rapidly, I sang to keep myself company. “Tonight, we are young” I sang, this of course helped. With my eyes watching the ceiling, I spotted some flags. This was a sign I was close to the end. Rolling onto my stomach I turned around and swam back to the other side. A while later we moved onto diving. "Now I've got to dive into the pool". I thought, feeling quite anxious. Watching everyone else dive, my instructor looked at me. "Uh oh" I whispered. After trying to convince my instructor I couldn't do it, she started to count down from 5. To get it done and over with I just dived in, I had no choice anyway. Before we started our lesson, our instructor had told us we were going to play some games after we dived. Sadly we had no time. Maybe next time. Here is an Anzac biscuits container I have designed. Hope you like it! Vincent Van Gogh is an artist, whose life was filled with sadness and anger. He was really depressed. 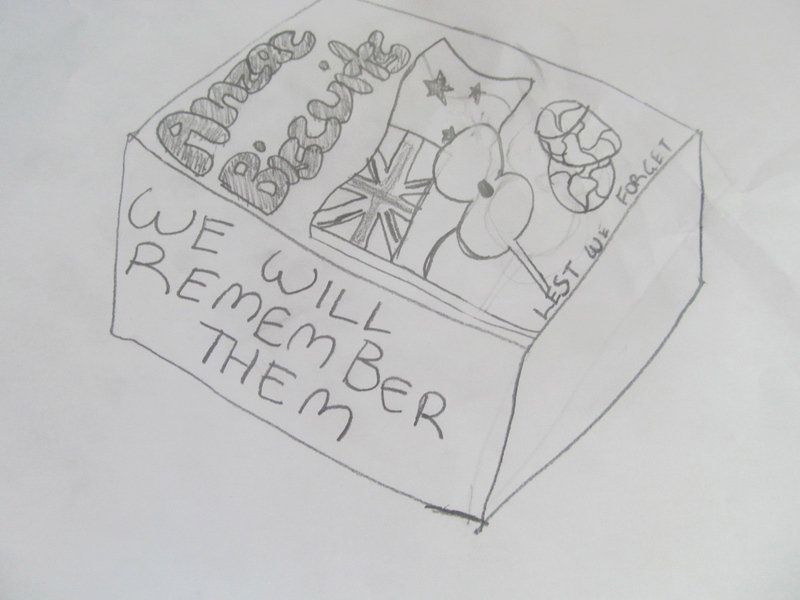 This artist was poor too. Because he had little money, he wasn’t able to buy paint to create paintings or food to eat. Luckily his brother Theo gave him some money to use. Van Gogh mostly used his money to buy paint. Which was a bad idea because most of the time he became hungry. Plus he was very unhealthy. Soon Vincent painted many pictures and only sold one for a few dollars. I’m thinking he expected a much more different result. Not many people appreciated him and his paintings. Since he was gloomy and bitter, he decided to cut part of his ear. Not the best idea, for it was very painful. In 1890 Vincent shot himself and died 2 days later. This dutch man was really in despair and it is shown in some of his paintings. He was just 37 years old. 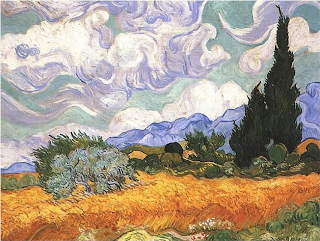 Here is one of Van Gogh's paintings. It's my favourite. This another picture I like. Here is the last painting that I liked. 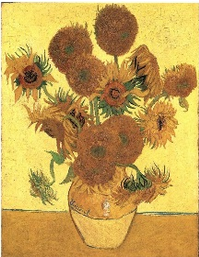 This bright majestic oil painting (Sunflowers) by Vincent Van Gogh was painted in 1888. The size is 73 by 92cm. 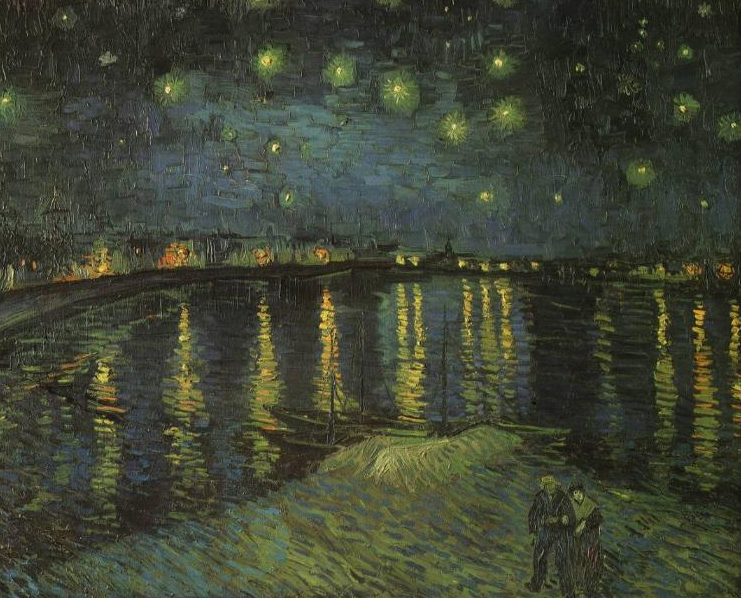 People in the 1800s never really thought Vincent Van Gogh’s art was great, he only sold 1 for a few dollars. Now Vincent’s paintings are worth millions. Van Gogh used mostly the colour yellow in this painting. It represents the emotion he was feeling as he painted; happiness. The texture of this painting is thick and rough. Even though I haven’t felt his painting before, it shows that Van Gogh had used a lot of paint on his bold thick brush strokes. Yellow brightens up my day as it is a primary colour. This painting is very convincing almost like it’s enchanted. Vincent painted this piece of art beautifully so to me there is nothing wrong with it. Just like I said before, Vincent was feeling quite happy as he painted, but I also think he was filled with joy and excitement. Considering that his close friend Paul Gauguin was coming to live with him. Van Gogh painted this to put in Paul’s room. He made 4 paintings of sunflowers. 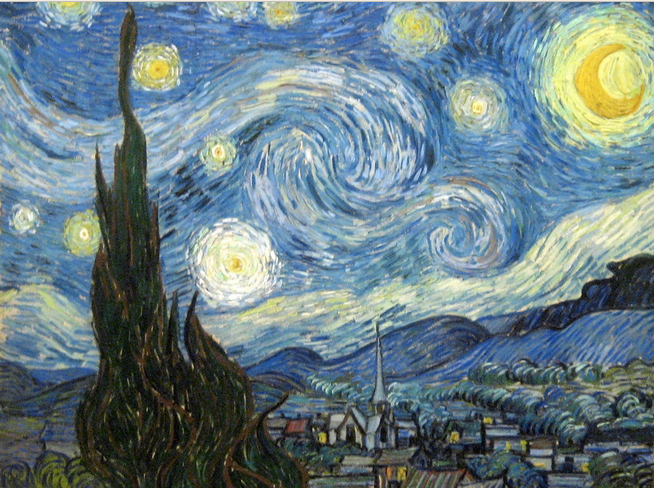 Vincent Van Gogh is one of the best artists in the world. Sadly he died before he became honoured.